Comments: This High Plains toad is found in open grasslands in several western Kansas counties where average annual rainfall is low. If surface water accumulates from rainfall in spring or summer, the green toad quickly utilizes it for breeding. To compensate for sporadic rains, the green toad is an opportunistic breeder and sometimes breeds in stock tanks. 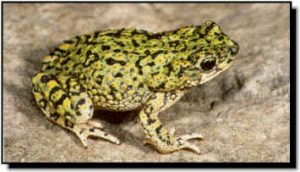 The green toad is one of the smallest and most colorful toads in Kansas. It measures less than 2 inches in length.